It seems most of my photography lately has been concerned with products and buildings, which is fine with me. But seldom does the architecture I shoot match the grandeur of this. This is the Glyptotek in Munich. The building’s name is a modern invention, cobbling together old Greek words ‘glyphein’ and ‘theke’, meaning ‘sculpture’ and ‘repository’, respectively. 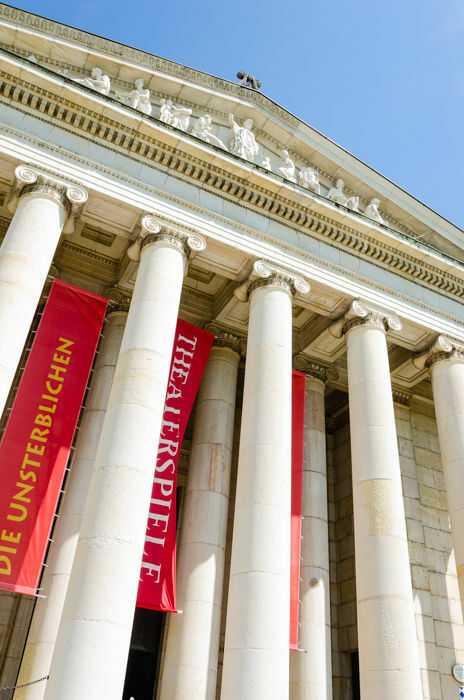 It is Munich’s oldest museum and is the only museum in the world dedicated solely to ancient sculpture. It was completed in 1830, but hit by bombs in the Second World War and then left to the elements for a time, which did the interior no favours. It was later refurbished over a period of years, and it reopened in 1972. From my perspective, it was just a wonderful thing to photograph. I took many other photographs of it, as have many other photographers – amateur and professional. But I particularly liked this one, with the main entrance and pediment caught in the sunshine, the red banners billowing behind and the whole ensemble climbing up steeply in portrait format. It is possible to zoom in on the original of this shot and see great detail in the recessed areas. However, this website only accommodates images 700 pixels across, so that cannot be appreciated very well here, and looking closely is likely only to reveal glitchy digital effects. But, if you are interested in high-resolution architectural photographs at full size and which maintain their pictorial integrity on a larger scale, for your business or other uses, I can provide other, more refined samples.